The Ancient Roman Calendar at the time of the first king of Rome, Romulus, there was no formal written calendar as such and the year was subdivided into ten months. We could regard this as the primitive calendar of the Romans. The ancient roman equivalent of the week was made of nine days. The Romans didn’t have week ends but they certainly had religious feast days – similar in approach to Saturdays or Sundays being the Lord’s day. 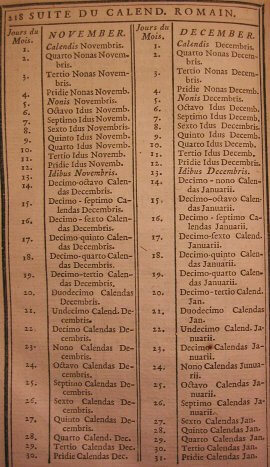 The calendar compiled by the second king of Rome, Numa Pompilius the Etruscan successor of Romulus, provided for a clear subdivision of the year “annus” into 12 lunar months and 366 days “dies“. 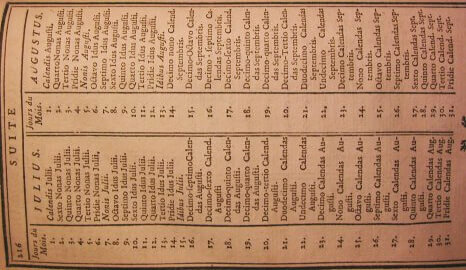 A period of five years was called a “lustrum” on account of the sacrifice performed by the Consuls after the five yearly census of the people. The sacrifice was called the Suovetaurilia, the animals sacrificed by the Romans were a pig, a sheep and a bull and performing it was referred to as “lustrum condere” hence the “lustrum”. 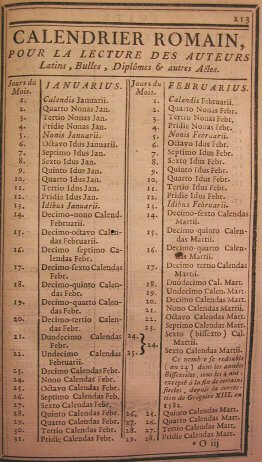 The name “Calendar” comes from the word “calends“, which was the name given to the first day of each month. In these early times, the first month of the year was March. Possibly in honour of the god of war Mars which was so important to early Rome. In fact Romulus himself was said to be born of the Vestal Virgin Rhea Silvia and the god of war Mars. 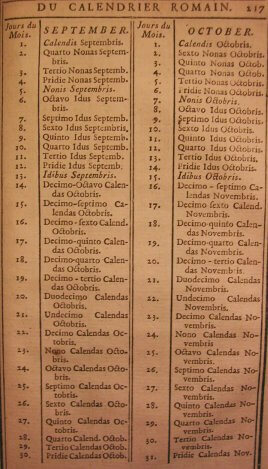 Numa’s calendar was used throughout the time of the kings of Rome and the Republic which came after right up until the time of Julius Caesar. 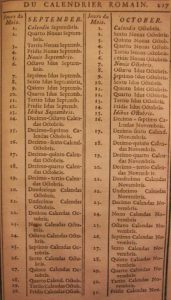 Julius Caesar had a second more accurate calendar elaborated ie some corrections were made and this new version was called the Julian calendar. Our current calendar was a further refinement of Julius Caesar’s which was worked out in the time of Pope Gregorius (Gregory the Great) during the early Middle Ages. 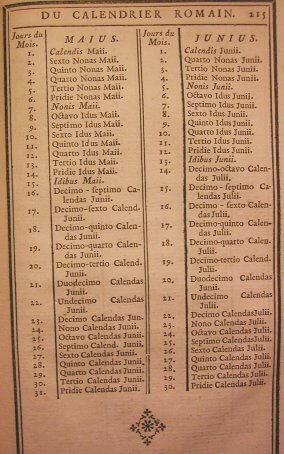 Only one example of pre-Julian calendar (ie Numa’s calendar) has been found. 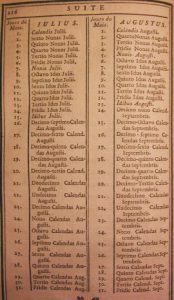 In it, the months of July and August named after Julius Caesar and Emperor Augustus, are still called by their original names of “Quintile” and “Sextile” ie fifth and sixth: remember starting from March!. Although the calendar was principally aimed at controlling the regular timing of the religious feasts it also controlled the military season and its own dedicated feasts. Throughout antiquity it was only possible to undertake war during the relatively good Rome weather or in any case when food is more plentiful. In Roman times the “war season” lasted from March to October and was opened and closed with the appropriate religious festivities presided by the Salii priests. 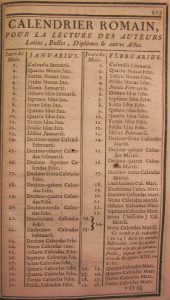 The management of the calendar was under the authority of the priestly order and at least at first, they had the power to shorten or extend this or the other month so long as the total number of days in the year was made to match correctly. Januarius. Month in the name of Janus, god of beginning and end. Februarius. Month in which the Lupercalia feasts were held. The beginning of the good season in which war and fighting could begin. Hence the month of Mars. The provenance of the name “April” is unclear. Perhaps it stems from aperire: to open. May was in honour of the goddess Maia, related to spring and plants. Julius, named in honour of Julius Caesar by decision of the senate (once he’d beaten the living daylights out of them during the civil war). 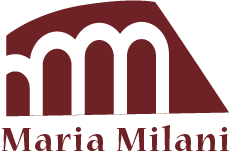 The seventh month (septem meant seven), according to the early Roman calendar which began with the month of the war god Mars (March). The eighth month (octo meant eight). The tenth month, from the latin word for ten – decem. 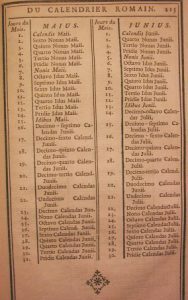 Although the calendar settled the fixed feasts, called “feriae stativae” there were also a number of “feriae conceptivae” which had no fixed date and were therefore fixed year-on-year by the priesthood. An example of this in Roman times was the Ambarvalia whilst in modern times we might compare this to Easter. Curiously enough both these examples are linked to the coming of Spring and regeneration and are calculated on the basis of lunar cycles. The length of days was measured according to the sun’s position and the first solar clock (sun dial) was imported in the third century BC from a Greek colony in southern Italy. Of course, having been constructed for a different longitude it never told the right time. 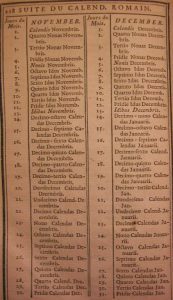 As already mentioned the first of the month was called the “calends“. The “nones” were the fifth and seventh day of the month, whilst the “ides” (well known to all I think) refer to the thirteenth and fifteenth of the month. A sort of Sunday recurred every nine days and on this day the farmers would come to sell their products at the village markets. The Romans were very fussy about holding feasts and events of importance on the right days. For example you wouldn’t want to get married in February whilst the second half of June was very propitious especially since it was the month directly related to the goddess Juno. The name of the month of February derives from the word “februo” to purify and it was during this month that the feast of the Lupercalia was held. In February we also have the principal feast in honour of the Ghosts of the dead called the Feralia.